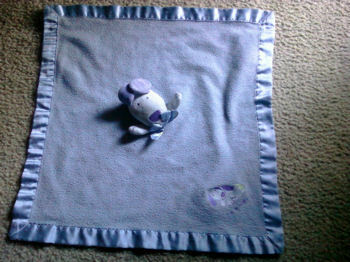 I’m looking for a 2003 Carter’s Woof blue dog blankie. It is all blue with a puppy head on it and satin edging around it. My 2 year old had this blanket from my 6 year old, and we couldn’t seem to locate it. We knew it was somewhere in our house, but it was hard on him, until we finally found it. So now I’m looking for a backup. Can you locate one for me? I do not have a PayPal account. Do you want me to purchase it on ebay for you, then you can send me the money for it? Here is one on ecrater that you can use a credit card though google checkout to purchase. Hope this helps. Best Wishes!